Children with disabilities are often invisible in education sector planning. Key actors from eight countries will meet to discuss challenges and new opportunities for inclusive quality education. The UNESCO International Institute for Educational Planning (IIEP-UNESCO), in partnership with UNICEF, is hosting a technical Round Table from 18-20 July 2018 in Paris, France, to support ministries of education in planning education systems to include children with disabilities. 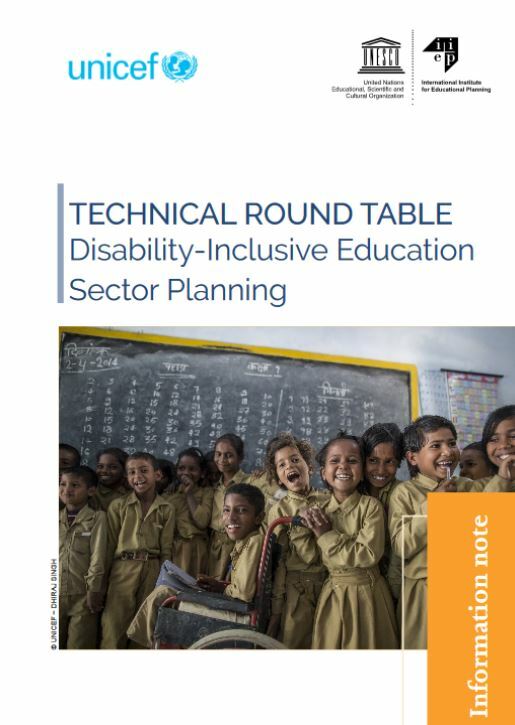 The upcoming Round Table will address these issues by bringing together government experts, development partners, and major national Disabled People’s Organizations from eight countries in sub-Saharan Africa and Asia and the Pacific*. Participants will take stock of current practices and opportunities for disability-inclusive educational planning and explore ways to address critical data and capacity gaps. IIEP’s Virtual Campus will also host a two-week preparatory virtual phase for the participants from 2 July to 16 July, as well as an open livestreamed “Data Dive” with a disability data expert on 10 July (watch the video below or click here). Stay tuned for more information and updates from the event. *The participating countries include Cambodia, Ethiopia, Fiji, Ghana, Kenya, Nepal, South Africa, and Viet Nam. They were invited to participate for their specific contributions to disability-inclusive planning. Read more about this technical Round Table in the information note.